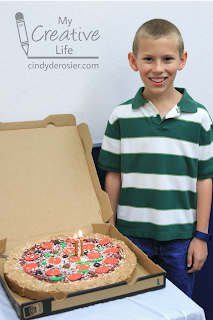 Today is Trevor's 11th birthday! 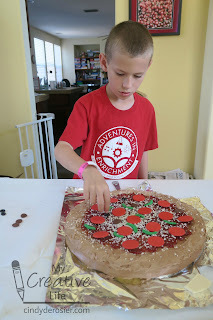 As promised, it's time to show you the cake we made for his pizza-themed party. Here he is with the candles lit and his friends singing. 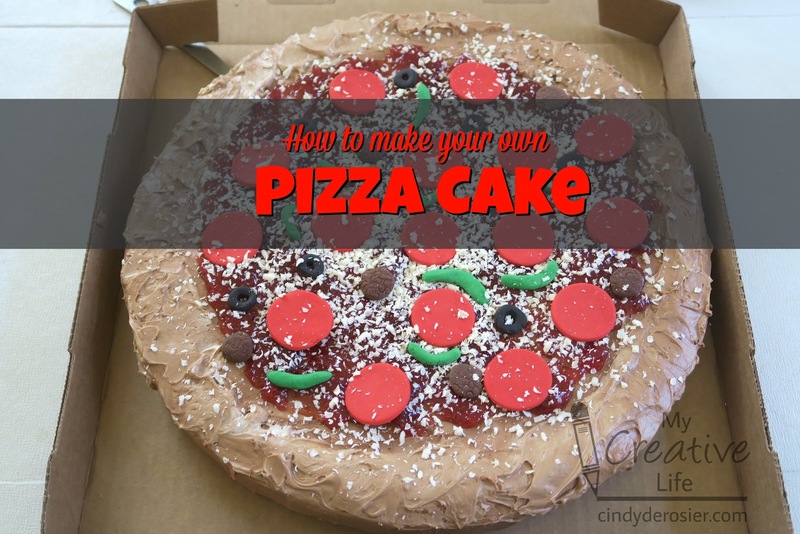 Interested in making your own pizza cake? 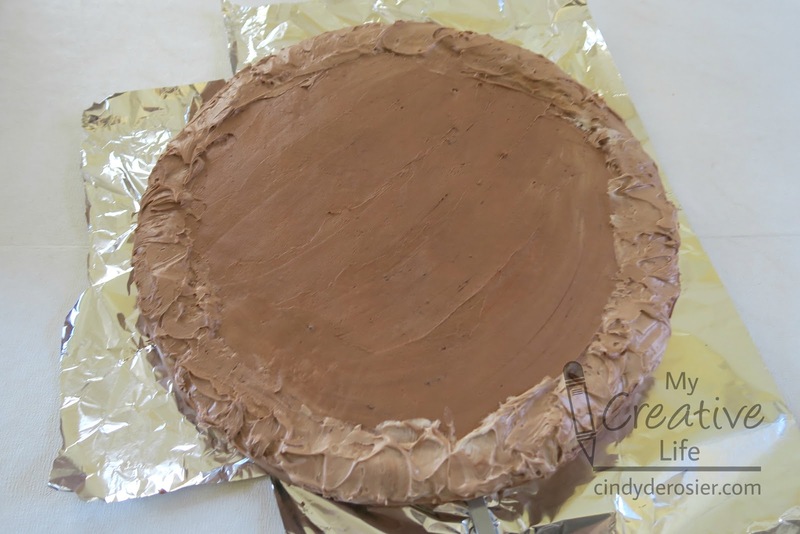 It's actually one of the easiest cakes I've ever done. Start by making your fondant toppings. These can be done days ahead of time. To make pepperoni, roll out the fondant with a silicone rolling pin, then cut perfect circles with a jigger. No need to buy a tiny cookie cutter if you have barware on hand! 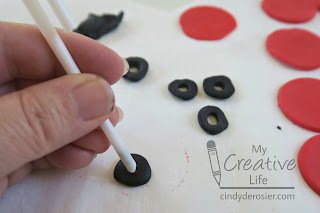 To make olives, shape a bit of black fondant into a flattened circle, then use a straw to remove the center. 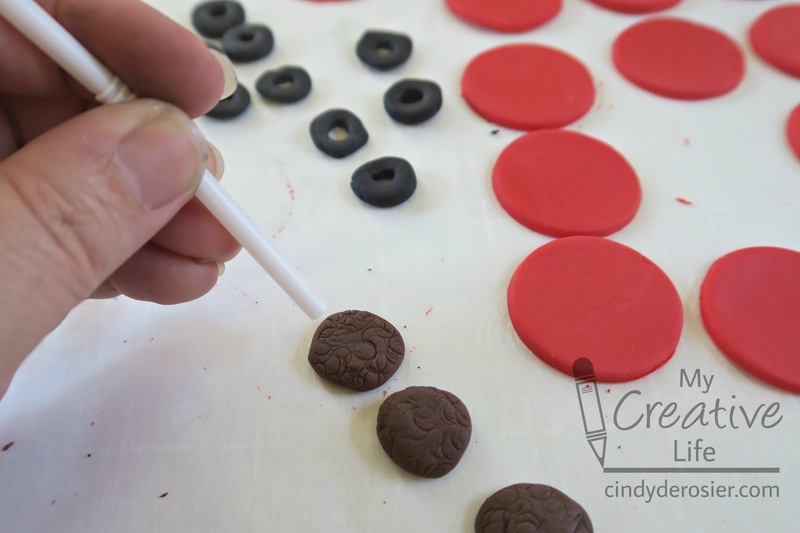 For the sausage, shape brown fondant into a flattened circle, then poke it repeatedly with the straw. Keep going until it looks like ground beef. 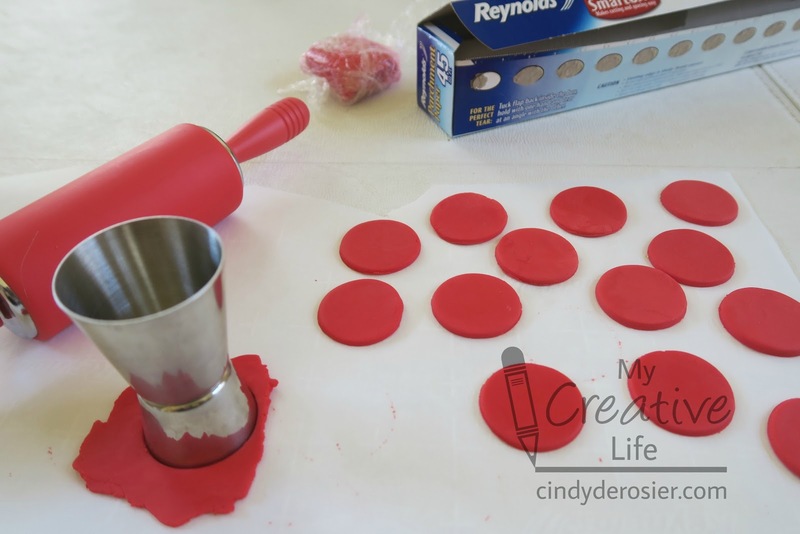 Make bell peppers by shaping green fondant into small curves. Preheat the oven to 325°F. Prepare the 14" pan using the cake release. 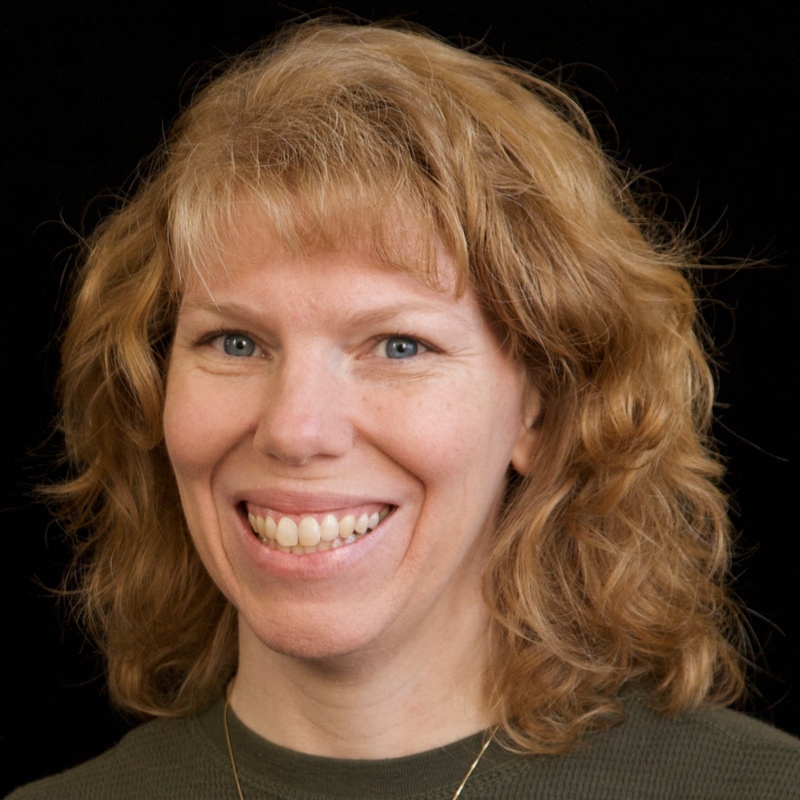 (If you have never used cake release, do it. 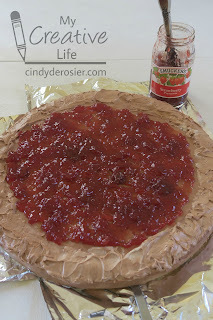 It will change your cake-baking life. Link below.) Make the cake batter following the directions on the package. Keep a close eye on it while it is baking. My cake took 18 minutes. 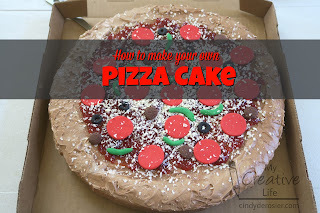 Let the cake cool in the pan for five minutes, then invert it onto the pizza peel or splatter screen. Put strips of aluminum foil around the edges. Add about a tablespoon of cocoa powder and a tiny bit of orange and yellow gel food color to the vanilla frosting. 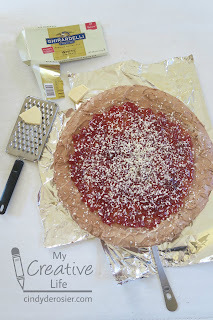 Keep adding tiny bits of each until the color resembles pizza crust. Spread a thin layer of frosting on the top and sides, then build up a thick layer around the edges of the cake to mimic pizza crust. Spread a generous amount of strawberry preserves on the cake. Grate white chocolate over the preserves. 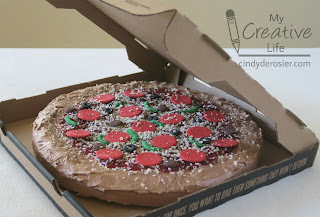 It helps to freeze the chocolate first, but it isn't crucial. Now place the fondant toppings on the pizza. Grate more white chocolate over the top of the cake. Remove the foil. 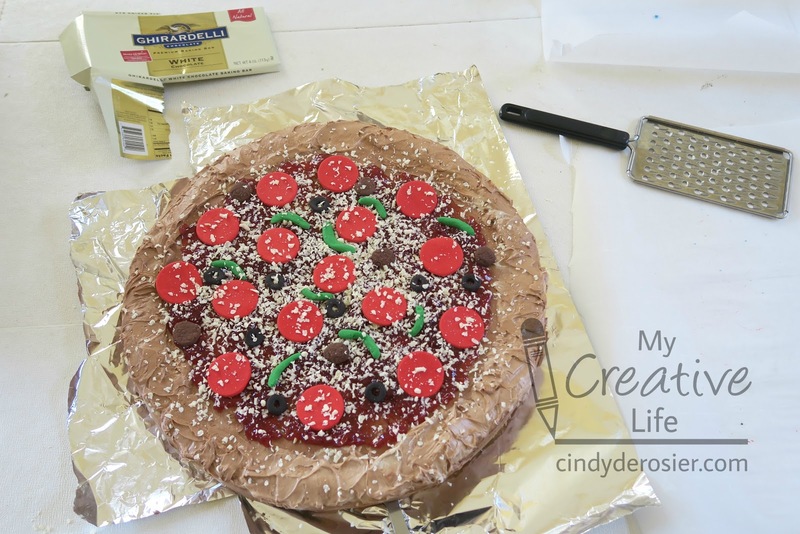 Use the pizza peel / splatter screen to place the cake in the pizza box, then step back to admire your work! Below are the supplies we used to make our cake. OMG!!!!!!!!!!! That is the BEST pizza EVER!!!!!!!!!!!!!! I love love love love it!!!!!!!!!!!!!!!!!!!!!!! Happy belated birthday to Trevor!!!! YAY!!! 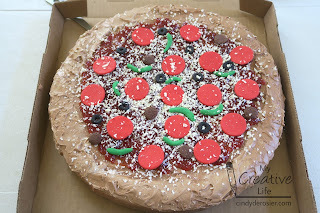 And I absolutely LOVE the amazing pizza cake. I agree with Julie - it's the best pizza ever!!!! So creative!! It looks amazing.